These questions are all designed to assist students in getting the most out of a single reading of Toni Morrison’s Beloved. I find the best approach to teaching this modern classic is to emphasize the poetic nature of its prose (and actually I typically cover it as a “break” between reading chapters of poetry). It has also been cited frequently as a novel to use on recent AP Open Essay prompts, as well as commonly required reading for higher level college English classes. 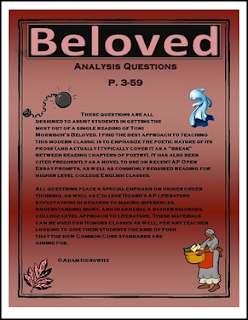 All questions place a special emphasis on higher order thinking, as well as College Board’s AP literature expectations in regards to making inferences, understanding irony, and in general a rather rigorous, college-level approach to literature. These materials can be used for Honors classes as well, for any teacher looking to give their students the kind of push that the new Common Core standards are aiming for. If you end up using the materials, please leave feedback about your experience. My name is Adam Horowitz, and I'm a sixteen year educator. You can e-mail me with questions at adam.horowitz@browardschools.com. All questions were written using the Vintage International edition of Beloved. As this edition has no chapter numbers, all questions are organized by page numbers (typically 60 page increments). If you are using a different edition, some slight adjustments for page numbers may be necessary (this version has approximately 324 pages). These questions are also designed to be used in conjunction with a 50 question Beloved test, which assesses their understanding of the novel and its themes. It includes mostly multiple choice questions, some challenging matching, and one comprehensive essay. Finally, in the complete novel package, I’ve included all questions, the test, approximately ten quizzes (which can be used as bellringer-type activities), Morrison background notes and a background note test, as well as a how-to-read the novel guide for students. All of these are packaged at a discount as opposed to buying them individually. Beloved p. 3-59 Analysis Questions by Adam Horowitz is licensed under a Creative Commons Attribution-NonCommercial-ShareAlike 3.0 Unported License.